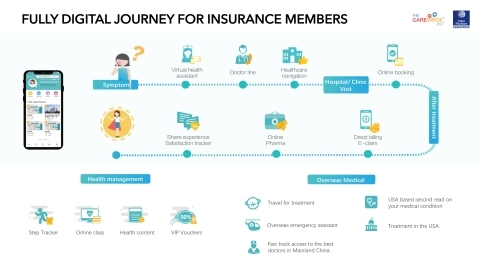 Inter Partner Assistance Hong Kong Ltd. has partnered with The CareVoice to provide fully digital health journeys and integrated healthcare solutions to the insurance market. Inter Partner Assistance Hong Kong Ltd. maintains an extensive hospital network and has over 25 years of experience in managing IPMI claims and providing emergency assistance 24/7. Inter Partner Assistance Hong Kong Ltd. already provides claim adjudication and assistance services to a majority of the Health and Travel insurance companies in Hong Kong. The CareVoice is an award-winning Shanghai based health InsurTech company which perfectly complements Inter Partner Assistance Hong Kong Ltd.’s footprint by adding a mobile-based and data-driven SaaS solution that digitalizes the healthcare and insurance journey with consumer’s interests first. “We are confident that our partnership with The CareVoice will provide new advantages for our healthcare partners and continue to accelerate our healthcare innovations by providing end customers with a transparent, integrated and personalized healthcare experience.” said Joseph Lee, CEO of Inter Partner Assistance Hong Kong Ltd. The CareVoice’s independent mobile SaaS platform breaks down barriers to bring easy healthcare navigation. Their unique platform also helps insurers to become true health partners to their customers by offering cutting edge innovations such as an AI voice-based Virtual Health Assistant for symptoms checker, powered by Sense.ly, with medical content originated from the Mayo Clinic. 1. Empower insurance partners with cutting edge innovation for their customers. Integrated platform adaptable to different environments (mobile app, web app, WeChat account) and operational in multiple languages. Fully digitalized customer journey within one mobile experience. Access to a voice-based Virtual Health Assistant powered by artificial intelligence. 2. Bring partners closer to their customers. Clearly and precisely explain medical insurance benefits. Engage with customers through personalized digital and health services. Reward customers when being physically active and selecting high quality cost-effective medical providers. 3. Drive efficiency and lower operational costs. Reduce unnecessary medical consultations by utilizing the Virtual Health Assistant’s symptom checker and triage. Adopt a fully digitalized hotline and e-claims reimbursement process. Receive actionable insights and data from anonymized customer usage behavior and post-claim surveys. About Inter Partner Assistance Hong Kong Ltd.
Inter Partner Assistance Hong Kong Ltd. has specialized in providing assistance, travel and health services since 1992. With access to a Group proprietary network of 37 Alarm Centers and more than 6,500 correspondents worldwide, Inter Partner Assistance Hong Kong Ltd. has since demonstrated its ability to be instantly reactive and effective in all circumstances, anywhere in the world, 24 hours a day. Inter Partner Assistance Hong Kong Ltd.